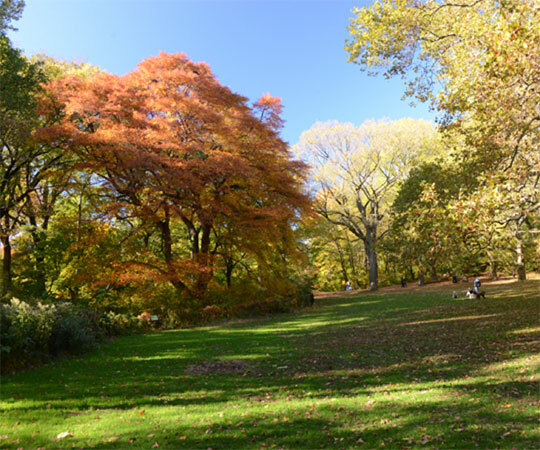 Central Park is home to more than 170 species of trees. From American elm to scarlet oak, many of them feature vibrant fall foliage. In appreciation of this photogenic time of year, we asked Alan Clark, Conservancy arborist, to tell us what trees you should look for this autumn and where to find them. Alan is a member of the Conservancy’s tree crew, which routinely prunes and inspects the Park’s roughly 20,000 trees. “Sugar maples are the most iconic trees for fall foliage,” Alan says. There are dozens of sugar maples – which turn a spectacular orange – throughout Central Park, and various New York City parks contain this species. Other maples are found in the Park as well, including the red maple, Norway maple, and sycamore maple. This genus of trees is known for its tasty syrup, its presence on the Canadian flag, and its beautiful autumn colors. Sugar maples can be found in Central Park and other New York City parks. They turn a spectacular bright orange each autumn. Tupelo Meadow, just north of Azalea Pond, features a magnificent three-trunked black tupelo offering a colorful display each year. One of Central Park’s most iconic spots for fall foliage, the Ramble’s Tupelo Meadow, is named for this species. In that area, you’ll find a magnificent three-trunked black tupelo offering a colorful fall foliage display, alongside many serviceberry, London plane, and American elm trees. 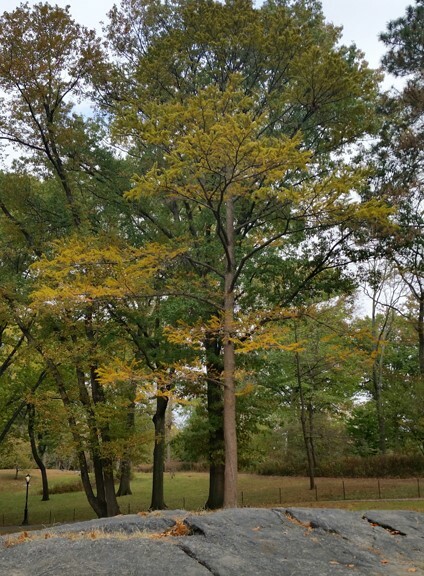 Ash trees, such as the green ash, can turn a variety of colors each fall, from purple to orange to golden yellow. They are popular urban trees that are at risk of going extinct because of the invasive, imported emerald ash borer beetle. For that reason, the green ash is a good tree to appreciate in all seasons, Alan says. In addition, ash trees represent the Tree of Life in mythology. A native of North America, the green ash turns a variety of colors each fall, and it's a popular urban tree found throughout New York City. There are more than 100 sweetgum in Central Park, and it was likely growing wild in the area before the Park’s construction. Arguably offering the widest color range of all the Park’s tree species, it can turn purple, orange, red, or even pink. Sweetgums have star-shaped leaves, making them pretty no matter the season. 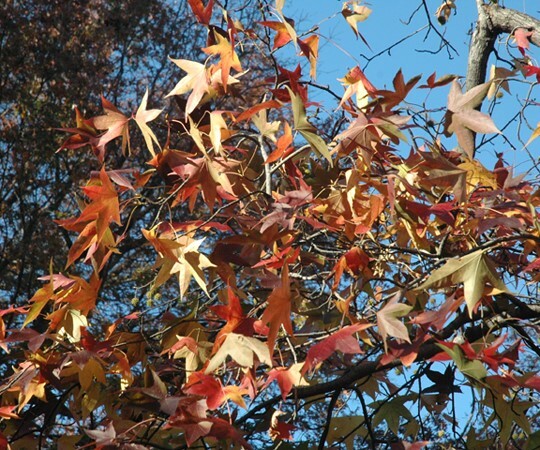 Look for star-shaped leaves to identify the sweetgum, which is plentiful throughout New York City. This tree can turn purple, orange, red, or even pink in the fall. It’s rare when trees are both coniferous (which means they have needles and produce cones) and deciduous (which means they lose their leaves each winter). 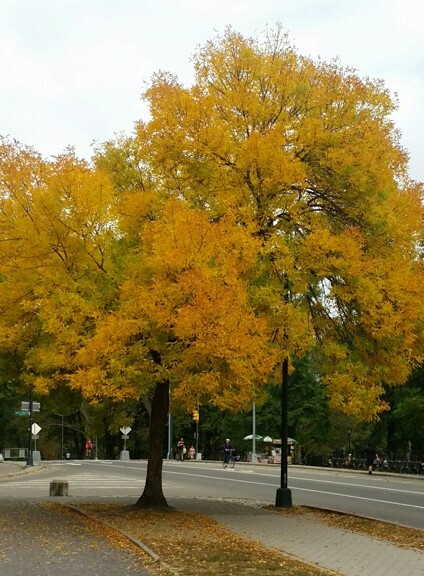 However, there are a few of these trees in Central Park — and they also offer fall foliage! The European larch and the American larch feature needles that turn yellow-gold before dropping to the ground each fall. Alan recommends heading to the west side to find larch trees in Strawberry Fields and north of the Delacorte Theater. Larch trees, found on the west side of Central Park, are unique fall foliage trees because their needles turn yellow-gold before falling to the ground. The needles on the bald cypress — found at the south end of Cedar Hill, near Gapstow Bridge, and at the Harlem Meer — turn golden-yellow and bronze each fall. And finally, the dawn redwood is another coniferous deciduous tree with needles that turn reddish-bronze. This tree can be found at Strawberry Fields and southwest of Conservatory Garden. Alan suggests several other trees for fall foliage, from pin oaks to gingkos. Visit our Tree Guide to learn more about these and other species found in Central Park — and download our fall foliage map to know where to visit this season. Wherever you find yourself admiring fall foliage in the Park, we hope you’ll share the vibrant colors with us! Tag @centralparknyc and use the hashtag #CentralParkFoliageWatch.